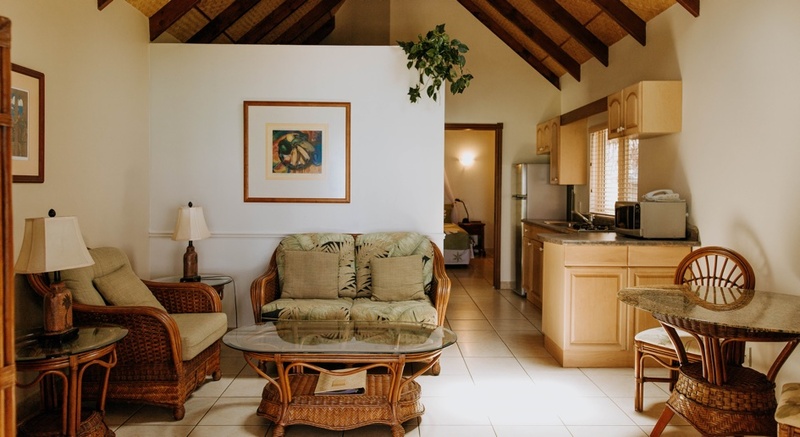 Spacious and modern, the Premium Beachfront Villas contain air-conditioning, sitting room, kitchenette and bathroom complete with your very own spa bath. Daily housekeeping service, linen and towels, microwave, tea/coffee making facilities, broadband internet access, wireless internet, telephone, television, toaster, hairdryer, ceiling fans, full-size fridge, veranda, room safe, stove top, complimentary fruit basket, iPod Dock, and an iron/ironing board are all available. Guests have the independence to self cater at this villa complex. While there is no onsite restaurant, transfers to and from nearby restaurants can be arranged. Enjoy the tranquillity of relaxing poolside or on a hammock overlooking the magical lagoon. Make use of the complimentary snorkelling gear and kayaks and explore all the lagoon has to offer. Royale Takitumu is an adults only property, guests 18 years and older are welcome. A welcome drink on arrival to the villa complex. A tropical breakfast basket in room on arrival. Exclusive guest-only events such as Morning Tea, Pétanque with Canapés & Bubbles, etc. Complimentary use of snorkeling gear and kayaks.